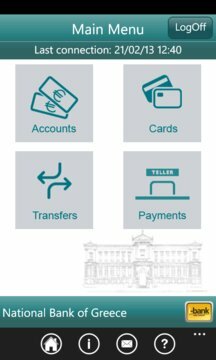 Fast and Secure i-bank Mobile Banking from National Bank of Greece. •	Perform all your banking transactions with one touch! Provided that you have already subscribed at i-bank Internet Banking, you can use the same user ID and Password to view from your Windows Phone device your account balances and the 20 more recent transactions on your accounts, your credit card outstanding balance and the 20 more recent movements; pay NBG credit cards, Vodafone, Cosmote, Wind, OTE, EYDAP, DEH, Forthnet,CYTA,On Telecoms,Ethniki Asfalistiki bills;make donations to Unicef; transfer funds between NBG accounts. •	Locate the nearest National Bank of Greece ATM or branch. Find easily and quickly our nearest ATM spot and check special capabilities offered such as automatic cash deposit (BNA). •	Contact National Bank of Greece. Talk to our Contact Center Representatives with just one touch. Your security is our priority. We use several advanced security measures and the latest technologies in order to provide you with high security and privacy during your i-bank Mobile Banking transactions and data transmission. 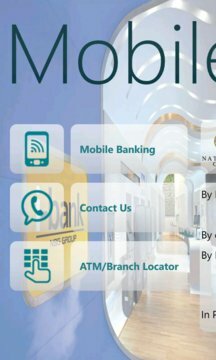 If you would like to use i-bank Mobile Banking, but you are not registered to i-bank Internet Banking services, please visit your nearest NBG Branch or i-bank store and subscribe to i-bank services. For further information visit our internet site at www.nbg.gr/microsites/i-bank/index.html or call our i-bank representatives at 181818. There is no charge from National Bank of Greece for downloading the application, but data rates from your wireless provider and i-bank Internet Banking fees still apply.